How to Become a #1 Amazon Best-Selling Author! YOU Can Become a BEST-SELLING AUTHOR! #1 Amazon BEST-SELLER – 100% GUARANTEED! WARNING: Includes Sneaky, Underhand Tricks NOT FOUND Elsewhere! And that title is just the beginning. There’s also the royalty money that follows – alongside your industry kudos, public appearances, affiliate commissions, back-end sales, and much more. Becoming an Amazon best-selling author is MASSIVE! And whether you realize it or not, there’s a VERY SPECIFIC FORMULA you can use to take your book STRAIGHT to that prestigious #1 spot on Amazon. It doesn’t require hours of work. It doesn’t require a chunk load of cash. It’s simple. It’s easy. It’s proven. And it works. So, how would YOU like to become a #1 Amazon best-selling author? Here’s Why You MUST Become a Best-Selling Author! Just By Following this SIMPLE, PROVEN Amazon Plan! In the world of books, Amazon is King. Your local bookstore may hold a couple of copies of your new book. But Amazon can hold thousands, ready to ship anywhere on the planet. It’s the world’s largest bookstore – and making it BIG on Amazon means making it BIG in life. Doors automatically open for those on the best-sellers list. You become more respected in your industry. Your business sales increase. You start to charge more for your speaking engagements. You become a local celebrity. You get more press attention. As your book sales increase, Amazon automatically begins cross-promoting your book with other popular titles. You suddenly find even bigger names wanting to joint venture with you. Your message is out there - and you’re doing GREAT. More cash. More prestige. More SUCCESS. And ALL because you managed to get your book into the list of best-sellers at Amazon. Most people never hit that best-sellers list, and certainly not the #1 spot. Because they don’t realize just how simple it can be. Discover the SECRET Marketing Plan That GUARANTEES Your Book Will Reach the BEST-SELLERS List at Amazon - Even If You Have to Use Our SNEAKY, Guerrilla Tricks! It incorporates a simple, no-hassle, day-by-day marketing plan that most authors would’ve never even THOUGHT about. It's completely FREE to start - and delivers AMAZING RESULTS. In Just 48 Hours – By Following THIS Secret Amazon Plan! PLUS: Figure Out How YOU Can Use This System Too! I’m Dan Strauss – and I’m sat here right now with best-selling author, Mel McIntyre. Over the past five years, we’ve helped shift books from being non-starters to being Amazon best-sellers. We’ve created – and then deconstructed – some of the most powerful book marketing campaigns of all time. Like an American friend that took his book to #1 over two days on Amazon – and turned over a shocking $50,000 in sales. Or how about the British team that cashed in £30,000 within the space of a day – just by putting this system into action? Each of these individuals followed a very definite plan for taking their book to that elusive #1 spot. It worked. Every single time. Whether you want to sell a pile of books, make a ton of cash, get your message out to the world, or become an official best-selling author – this system can MAKE IT HAPPEN. And now, for the very first time ever, we’ve distilled this system down to its very essence – and made it available. To YOU. To the E-mail Addresses That GUARANTEE Your Success! If you want to be an Amazon best-selling author, there is absolutely NO OTHER GUIDE that will get you there as fast! The Best-Seller Secret is the most thorough, most creative guide to getting you onto that best-seller list – absolutely GUARANTEEED, sometimes using the sneakiest, craftiest methods "in the book." And it doesn’t matter if you don’t know a single THING about marketing. Most authors don’t. So long as you can follow a few simple instructions spread over a couple of months, YOU can become a best-selling author. It’s all inside The Best-Seller Secret. So, want to take a sneak peek inside this inspiring new book? The LITTLE-KNOWN TECHNIQUE for grabbing celebrity endorsements that will make your book FLY off the digital shelves! How to CASH IN on those that buy your book, again and again – all thanks to a simple database system! Discover the 4-point A.I.D.I. FORMULA that absolutely EVERY Amazon best-seller sticks to! Grab the EXACT E-MAIL ADDRESSES that brought in more than $50,000 of book sales – in just one day! How to turn your BEST-SELLER CAMPAIGN into a plan for creating long-term sustainable sales! Uncover the FOUR REASONS why you absolutely MUST write a best-selling book – NOW! Discover how online bookstores like Amazon can use their tools to make you FAMOUS! Learn the SNEAKY TRICK that will GUARANTEE you a TOP TEN position in the Amazon charts – TODAY! - it’s easy, it works, and it WON’T cost you a penny! How to use our CAMPAIGN FLOW CHART to ensure your entire marketing campaign is kept on track, easily! Our THREE MONTH Countdown Plan! – Follow this plan and you’ll always know what to do next. Starting three months before – right through to the big "best-seller" day, and beyond! The ONE SIMPLE TRICK you can use to begin LEGALLY stealing profits back from Amazon! The SECRET behind the BEST BOOK COVERS – here’s precisely what you SHOULD and SHOULDN’T do! UNCOVER the power of FREE GIFTS! – and how you can use them to practically MAKE people to buy your book! How to figure out your TARGET audience – and how to use that to boost your Amazon sales! The FIVE TRICKS for collecting KILLER endorsements – and the contacts you absolutely MUST know! How to get YOUR book recommended by AMAZON itself! - Yup. This one you've gotta read! How YOU can hook up with BIG online networks, to rocket your book sales – in just days! The TRICK to enlisting online helpers - with an irresistible offer that costs you ABSOLUTELY NOTHING! The FOUR-POINT FORMULA for building your own LOYAL list of subscribers – and cashing in on them, over and over again! The LITTLE-KNOWN NEW Amazon publishing service – that could mean you keep EVEN MORE of your book’s sales price! How YOU can make as much as $50,000 from your book – with just a few days’ work! Discover PRECISELY what you MUST DO if things start to go wrong – and exactly how to rescue a potentially bad situation! How to create SPECIAL BONUS FILES that will practically sell your book for you! How you can CREATE a BUZZ about your book – and get online communities anticipating its release! It all starts, for you, TODAY. Are YOU Ready to Become a BEST-SELLING AUTHOR? Here’s How YOU Can Obtain the ENTIRE GUIDE at our Lowest Price EVER – Without Paying My $300-an-Hour Fee! Are YOU ready to see your book hit the Amazon best-sellers list? Are YOU ready to join the elite bunch of authors we’ll TELL YOU ABOUT inside our guide (and we’re talking MASSIVE NAMES) – that have used this system with outstanding success? Is this YOUR time to go from small-time writer – to BIG-TIME #1 Amazon best-selling author? Now, if you were to ask me to explain this system to you in person, it’d cost you around $300 PER HOUR. Well, this course doesn't cost that. Well, that makes the $97 price tag of The Best-Seller Secret a virtual no-brainer. APRIL UPDATE: For the month of April, we’ve reduced the cost of The Best-Seller Secret down to JUST $37. That’s the cheapest we’ve EVER offered this guide – but ONLY if you purchase before the end of April. I know you’re not the sort of person that would throw away the entire success of your book – just because you can’t be bothered to research what worked for every other successful Amazon best-selling author. Grab your copy of The Best-Seller Secret – and get this plan into action. Starting TODAY! And MUCH MORE – FREE When You Buy This Month! I want your book to be a real Amazon success. Because then you’ll write to provide me with another unsolicited testimonial. Which ultimately results in more sales for me. 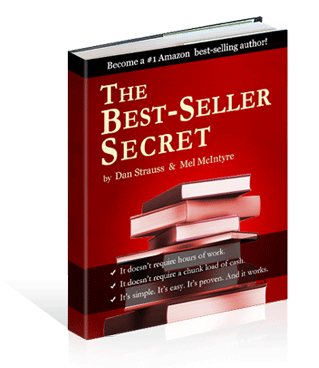 That’s why both myself – Dan – and my co-author, Mel, have worked to create a series of exciting bonus guides which are YOURS – absolutely FREE of charge – when you try out The Best-Seller Secret. There’s NO catch and NO small-print. Books don’t write themselves, so don’t expect them to promote themselves either! This genuine, down-to-earth guide unveils the 20 BEST methods of getting your book in front of the world – from photo opportunities to sponsorship to “bargain baiting”! We’ll show you what works, and what doesn’t. "What’s Your Book REALLY Worth?" – Think you’ve priced your book right? Think again. This guide unveils the latest in psychological research – ensuring you get the BEST price for your work. Will a higher price tag actually INCREASE sales? How about adding a “Second Interest” – and popping $5 onto the book price? Guarantees, credentials, bonuses & more – this guide gives you everything you need to price your book perfectly. Looking for an endorsement? Looking to hook-up with an online network? Want to write a sales letter for your book? Here are the EXACT sample letters and e-mail templates you MUST have. This is CRITICAL – and we’ve made it oh-so-easy to get started! And YES – these are ALL included at the current SPECIAL OFFER PRICE of just $37. Are YOU ready to download The Best-Seller Secret – and all of these bonuses – right now? Don’t delay a second longer. Click on THIS LINK and grab YOUR copy, while you still can! Discover the ENTIRE SYSTEM Absolutely RISK-FREE! Hit That #1 Amazon Position, We’ll Refund Every Penny!" You won’t risk a SINGLE PENNY trying out The Best-Seller Secret. Honestly. That’s our absolute GUARANTEE to you. We only want 100% thrilled customers discovering The Best-Seller Secret. It simply isn’t worth our time having disgruntled buyers. That’s why we’ve created an EXCELLENT GUIDE - with amazing bonuses. And that’s why we’re also giving a 100% RISK-FREE GUARANTEE with every single copy. We PROMISE that you’ll get your book into the top ten Amazon best-sellers list. If you just follow our simple, no-cost plan, you’ll undoubtedly hit #1 – at least in your category. If you don’t (and we even include a sneaky method of guaranteeing it inside our guide!) – or if you’re not thrilled for ANY other reason – just let us know and we’ll refund your entire purchase price. All that we ask is you try out the guide for three whole months. That’s the amount of time we recommend (working minimally!) to setup your marketing campaign. If you’re not top of the Amazon best-sellers list in that time, or aren’t happy for any other reason, let us know in under four months, and we’ll refund EVERYTHING you paid. NO small print. NO tricky return procedures. Just a solid, honest GUARANTEE – to backup an AMAZING guide. Not only that, we’ll also let you keep the bonus guides free of charge – as our way of saying thanks. Your LAST CHANCE to Purchase At Our BEST PRICE! Our 100% GUARANTEE, 24/7 Support + MUCH MORE! Are YOU getting ready to become a #1 Amazon BEST-SELLING AUTHOR? Because once you receive this information, you’ll want to spring straight into action – and within three months, MAXIMUM, you’ll be seeing your book on the top of that list. Whether it's a existing book in publication - or a new one you've just written. Read our 90-page guide and discover how to get your book to that elusive #1 spot on the Amazon best-sellers list! Discover the simple marketing system other authors have followed to get to the top – and how YOU can do the same. Includes sneaky, GUERILLA tactics for beating the system that you won’t find ANYWHERE ELSE! FREE - Promote Yourself & Your Book: 20 Techniques That REALLY Work! Our quick-and-easy guide to getting your book out to the world, using little-known methods you’ve probably never even thought about! FREE - What’s Your Book REALLY Worth? price and worth of your book, without it costing you a bean! FREE - The Sample Letters & E-mail Templates You MUST Have! Don’t worry about writing another e-mail message to help market your book! Here are samples for endorsements, joint ventures, sales letters & more! THREE MONTHS 100% Risk-Free Guarantee! everything you paid. And you even get to keep the bonus guides, too! 24/7 SUPPORT from our Publishing Team! Got questions? Need help as you move forward with your marketing campaign? a special address for getting in touch! And all of this for the current special offer price of JUST $37. We have literally NEVER offered so much before at such a tiny price. Do it now. Grab your copy and see where it takes you. You’ll be amazed – this solid system has worked before, and it’ll DEFINITELY work for you. We all dream of becoming a best-selling author. It’s the ultimate accolade of any writer. And to become an Amazon best-selling author is the cream of the crop. Well, now, that prestigious title is available – to YOU. All you have to do is follow this simple, no-effort marketing system – just like the individuals we’ll tell you about inside the guide. Step by step, you’ll watch as your book starts to soar through the charts – and your profile increases. You’ll enjoy more business sales. More kudos. More speaking engagements. More local “celebrity appearances.” More joint-venturing. More cash. More press attention. More book sales. More SUCCESS. And all because you decided to invest less than forty bucks learning about a system very few authors even know about. You’ll only regret it... if you don’t. Thank you for taking the time to visit our site today! Best-selling author, "Top Copy Guy"
PS. This guide is NOT available anywhere else! That’s right. It’s 100% EXCLUSIVE to this website. You won’t find it on Amazon, in stores, on eBay, or elsewhere. You can ONLY buy it here – today. Nobody else will share these secrets with you. And not at this price. So click HERE to grab your copy – NOW! PPS. There’s NEVER been a better time to own The Best-Seller Secret! We’ve literally NEVER reduced the price lower than this before. It’s a total scoop. So, don’t miss out on our April special. Grab your copy TODAY – and claim those free bonuses, too – by clicking HERE! PPPS. Can you imagine life as a #1 Amazon best-selling author? You’ll be the envy of your peers. You’ll enjoy a boom in your business sales. You’ll be asked to attend signing events, local book clubs, and photo shoots. You’ll become a celebrity in your own right – and only YOU know what that can mean for your own projects. So, take action NOW. Click HERE to grab The Best-Seller Secret!